Tim talks to me in ways that I did not anticipate. I’m not talking about dreams. Those are rare these days, but even when I see him it never surprises me. That was something he seemed to establish in the beginning of all this. Although no words have been exchanged lately when I do see him in my dreams, I wake up thankful and comforted like when you hear news that an old friend you’ve lost touch with is doing well. The books though, the books are surprising. Now you have two choices as you continue to read the rest of this post. You can take this as a grieving woman foolishly searching for any signs of her lost love, or you can join me for a some emotional folly. Me? Well I’ve never been too proud for a little bit of folly. I was visiting my friends and their new baby when the first book snuck up on me. “Well this book is WEIRD,” he said as he handed it to me to read. Now if you’re not familiar with Neil Gaiman, a lot of the stuff he writes is weird. I’ve read some which included a hybrid spider person as a main character, but Tim devoured everything the man wrote. I kept all the Gaiman books he owned with plans to read them when I was ready, and as I flipped through the children’s book, Blueberry Girl, I felt like the words were written just for me. It has a video from YouTube which is the poem narrated by Gaiman, and it’s worth a listen if you haven’t heard it. As I read the book, a line stood out to me in particular. 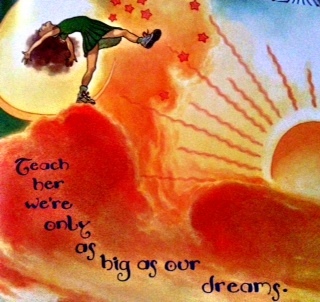 Teach her we’re only as big as our dreams. I’ll try, I thought as I paused at the page. The weird thing about the book is that my friend’s have no idea who sent it. It showed up from Amazon with no note or return address. Of course what’s likely is that one of their friends (perhaps a literary friend) sent it and simply forgot to mark as a gift. That’s the logical answer, but I prefer the nebulous. Either way, I got a message to keep dreaming and keep trying from my husband’s favorite author in a time that I needed it. My second surprise has technically been waiting for me since 1943. Working at an office of gamers, previews for animated movies get passed around email chains more often than corgi gifs. That’s how I found myself batting back tears at my desk a few weeks ago when I first saw the trailer for The Little Prince. Now as a self proclaimed writer and lover of books, I’m ashamed to say that I had never read The Little Prince. Yes, it’s a beloved classic around the world and translated into more languages than I can count, but somehow it totally missed my radar as a kid. After I watched the preview several times in a row like a crazy person, I decided that I needed to read this book. That night at home, I went to my bookshelf to find Tim’s copy. I did with very little difficulty, but it was in French. “Every high school French class has to read this,” he said so many years ago when we first put our books into the same bookcase. I didn’t remember him having a strong opinion of the classic, but decided to order an English copy for myself since I didn’t anticipate add learning French to my list of current activities. Last night I dived into the book. I expected a sweet story with a few good lines, but in actuality I sat there and sobbed with this tiny little book in my hands. (If you haven’t read the book and want to be surprised like I was, stop reading now). I traveled through that story like someone hungry for enlightenment, and there was so much to choose from. The dynamic with the fox is something I’ll probably write another post on entirely, because as I read each line I just thought about Simon hanging his head over the gate of his pasture and licking my hand while the sun set behind him earlier that night. But we’re talking about Tim and not Simon, so let’s get back to that. When the Little Prince explains to the narrator his gift of the stars, I couldn’t think of anything but Tim. The words on the page grew blurry from my tears, but they weren’t words from a fictional dreamer anymore… they were from him. They were from Tim and the laughing stars were the skies we gazed at together in hill country, in Maine or really – around the world. They were the same stars that I’ll see on a clear night at the barn and think to myself, Tim would like this sky tonight. As I read those words I cried not only because I missed my husband so much, but also because I am so content to have known him. I guess in the end it doesn’t matter how I come across the things, whether it’s some divine intervention or just dumb luck. The words on the pages fill a gap in the void that exists without being able to talk to my best friend. They offer suggested answers for complicated situations where there are no real answers. I’ll never know, but I don’t care to know for sure. Folly doesn’t bring hope if you dissect it to death. <3 Such a full heart, even if it's in a thousand pieces. I couldn’t think of a better way to put it myself. I read the part of the little prince where the fox talks about knowing the sound of his friend’s footsteps in my wedding. I have never read the whole book, but I need to. So very lovely. Thanks for sharing this. This is really special and I’m so glad you allow yourself to experience these meaningful moments and that you don’t just write them off as silly- because they’re not. Regardless of whether the messages are somehow from Tim or a bizarre coincidence of the universe, the important part is that they bring you comfort. You find those messages because he left them – in the thousands of conversations your had, the silly moments, the serious and hard talks. The time you spent and the love you build together laid the groundwork for you to find. However you find meaning, what matters is that you found it and what it is to you. Life is just a series of experiences and choices, and we all take a different path. Just because no one else sees the profound in a few lines from kids books doesn’t mean that you shouldn’t. Hold on to what gives you comfort and direction. That’s the important thing. Pass the tissue please. Just beautiful. What great messages. Thank you for sharing this remarkable message. 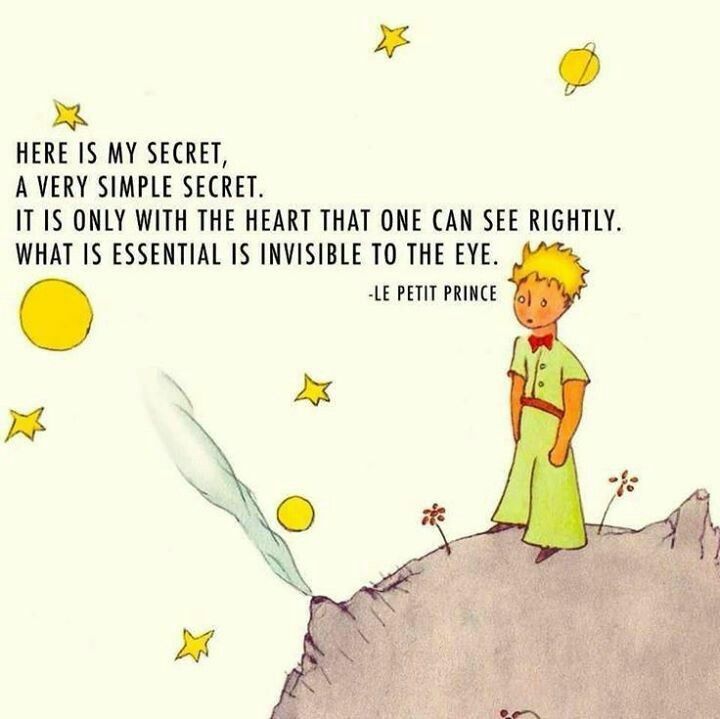 It sounds like The Little Prince is much more than a kid’s book. Such beauty, I skipped the end as I haven’t read the book and want to. I really like the Blueberry Girl though, what a great poem! Keep believing in folly, for that is one of the few things that keeps life magical. Perhaps you could also read “Badger’s Parting Gifts.” It’s a kids book — and one I re-read all the time. It has taught me that death really isn’t. It taught me to recognize circumstances where our loved ones and soul mates still live. It shows how to bring the signs, messages, memories and legacies — to life. I don’t think it’s strange at all. I’ve heard of a lot of people who have had similar experiences. Another beautiful and well written post. I think I need to read this book too and it would be a good thing to add to the collection in the library for my girls. We see what we need to see and feel what we feel. I find myself ‘seeing’ and ‘feeling’ small messages from my Dad still. He died a little over 20 years ago. I catch myself asking “What would he think of this? or What would he say?” Sometimes there are no answers to those questions yet. Tim will always be there for you. You had that kind of connection. Cherish that, as many people never get to experience it even once in their lifetime. Tim is still sharing his great love for you. Thank you for sharking it with us. Beautiful messages from Tim – thank you for sharing it with us. A few hours after I read this post I went through all my books looking for something to read while I’m waiting for books to come in on Amazon. The last book I had left was Anansi Boys by Gaiman. My sister sent it to me about a year ago and it never struck my fancy…never judge a book by the cover 😉 About half way through I looked at the author’s name and realized it was the same as in your post! I hadn’t thought anything of it when I read it earlier to be honest, when I read the comment about your friend mentioning a weird children’s book I thought you were going to say The Little Prince (which was the last book I read in French, by the way). Long story short, I like this post, coincidences are great, and more people should read Neil Gaiman. my husband died suddenly 14 months ago and reading your blog about being comforted when you dream of him is so true thats the way i feel. its really hard but i feel his spirit all around me o this land he loved and in the faes of his sons.i know how you feel you are not alone. This had SUCH an impact on me as a young french student in my teens. I STILL have it memorized after all these years. “Vous êtes toujours responsable de ce que tu as apprivoisé,” ~ You are forever responsible for that which you have tamed.